I learned, deep in my cells and interstitial spaces, that ALL of life is FOR me, all of life is participating with The Great Current. I find it quite poetically satisfying that our move to France took us to live in the Languedoc region — a word which translates literally as ‘the language of yes’. And like all seemingly-innate gifts, I come by my ability for Easing and Inviting by way of its opposite… An environment-of-origin that was anything but easy and inviting. So here I am, living inside this healing and ever-growing expansity of my whole self, in this characteristic way that we gorgeous humans have, benefitting from this lovely gift we all have for taking our wounds and harvesting our already-always-there wholeness. And then, joyfully rippling out to our corner of the world the very thing that we had needed most — because we were finally able to claim it fully for ourselves. We are finally able to let love in. And our creativity out. I suspect it’s your, too. 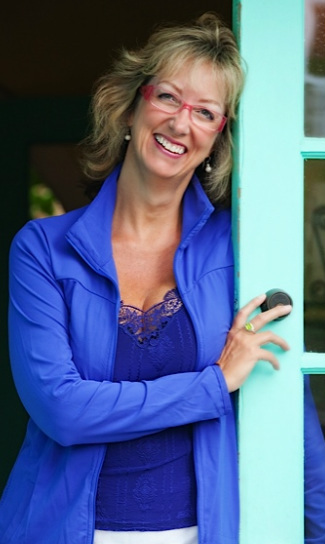 Hi, I'm Claire O'Connor, creator of The Sweet Spot and The Sweet Spot Cafe Online Community. Since 1985, I've helped people like me (and especially including me!) become more consciously creative, alive, playful — and fed by the sensual, sensory beauty of our soft animal selves and our surroundings. I have over 25 years' experience as a facilitator of women’s personal growth groups, and as a healer drawn to energies, bodies, creative expression, creative flow, creative spaces. Looking up the root of the term ‘facilitator’, I find the word ‘facile’ — French for ‘easy’. Perfect. My every day is fed by the ongoing practice of intentional ease. So that is who I am — I’m an easifier. Or, more simply, I’m an easer. I bring ease. Not so much bring, but rather, re-remind. And more than that, I’m an inviter. I invite. And I'm inviting YOU to the south of France, to deepen and widen your love affair with filling the canvas of your sweet, wild and precious life. Won't you consider joining me?